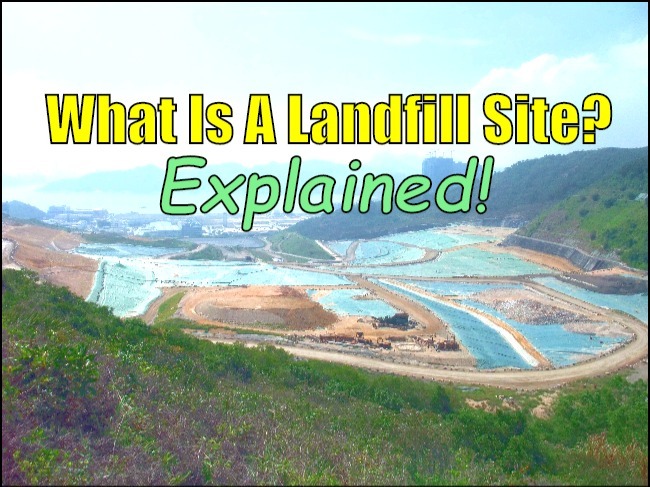 So, you want to know, What is a Landfill Site? In this long curated article we have pulled together and combined a wide range of excerpts from mostly UK and US sources. We hope the information included will satisfy the needs of both casual readers, and professionals seeking a ready point of reference for this subject. All the content is attributed, and readily verified via the links provided below each section. Download this page “What is a Landfill Site?” as a pdf file. (Free). Click Below. 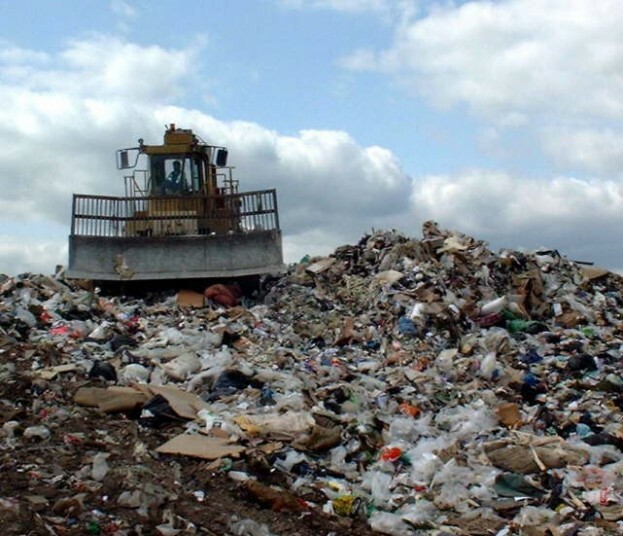 A landfill site is an area of land that is used to dump rubbish, either directly on the ground (landraising) or filling an unwanted hole in the ground (landfilling). It is the oldest form of waste treatment (although the burial of the waste in engineered cells (also known as Sanitary Landfill), is modern; historically, refuse was just left in piles or thrown into pits). Landfills have been the most common method of organized waste disposal and remain so in many places around the world. What type of rubbish does a non-hazardous waste landfill site contain? Non hazardous waste landfill sites contain both household and commercial rubbish. Household rubbish is mostly organic, for example food, paper, cardboard or wood. Other household rubbish contains plastic or tin packaging. Sites filled up before 1960 contained very little organic matter. This is because most people burned their rubbish on open fires at home. Find out more about what’s in our rubbish. Most of the rubbish put in landfill sites today is from construction and commercial businesses, such as soil, concrete and brick rubble. This is known as inert waste because it is unlikely to react with other rubbish, making it relatively safe for landfill. 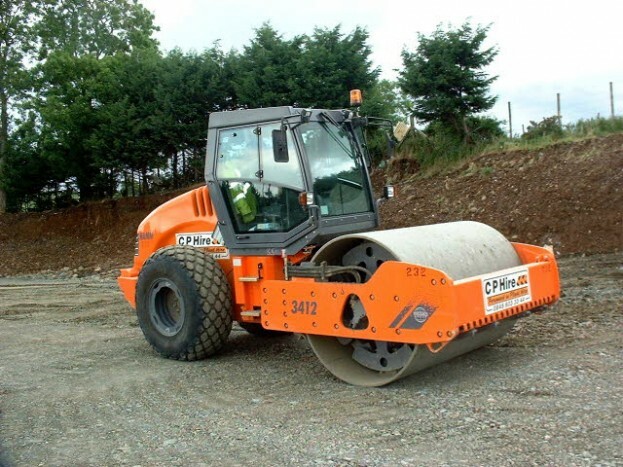 A lot of inert waste is used for building roads on the landfill site or to cover the site when it is full. What type of rubbish does a hazardous waste landfill site contain? Hazardous waste landfills are mono-disposal landfills which contain different types of hazardous waste in separate lined cells so that the separate waste classifications of the EU Landfill Directives, as defined within the Waste Regulations, do not mix. Waste is considered ‘hazardous‘ under environmental legislation when it contains substances or has properties that might make it harmful to human health or the environment. 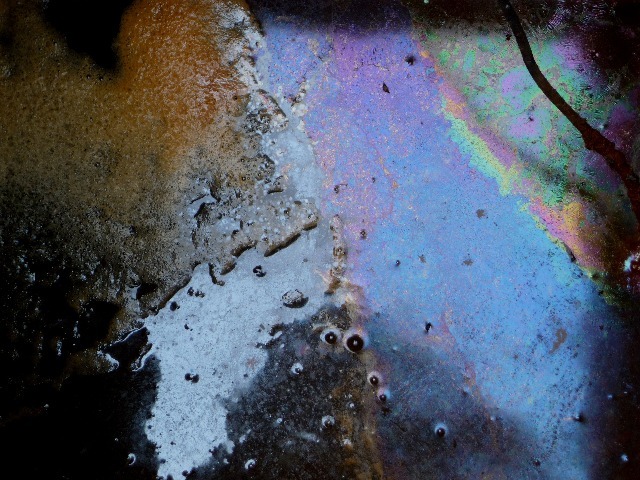 … Hazardous waste is defined in the Hazardous Waste List incorporated in the European Waste Catalogue. Waste is considered ‘hazardous’ under environmental legislation when it contains substances or has properties that might make it harmful to human health or the environment. This does not necessarily mean it is an immediate risk to human health, although some waste can be. Many wastes are newly classified as ‘hazardous’ and some companies will now find themselves dealing with hazardous consignments for the first time. Hazardous waste is defined in the Hazardous Waste List incorporated in the European Waste Catalogue. What type of rubbish does an inert waste landfill site contain? Inert waste is waste which is neither chemically nor biologically reactive and will not decompose. Examples of this are sand and concrete. This has particular relevance to landfills as inert waste typically requires lower disposal fees than biodegradablewaste or hazardous waste. Basic Information about Landfills – What is a landfill? Modern landfills are well-engineered and managed facilities for the disposal of solid waste. Landfills are located, designed, operated and monitored to ensure compliance with federal regulations. They are also designed to protect the environment from contaminants, which may be present in the waste stream. Landfills cannot be built in environmentally-sensitive areas, and they are placed using on-site environmental monitoring systems. These monitoring systems check for any sign of groundwater contamination and for landfill gas, as well as provide additional safeguards. Today’s landfills must meet stringent design, operation and closure requirements. In the US these have been established under the Resource Conservation and Recovery Act (RCRA). 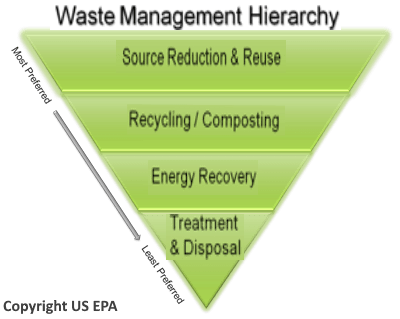 The US EPA, in common with very many other countries, encourages communities to consider the waste management hierarchy – favouring source reduction to reduce both the volume and toxicity of waste and to increase the useful life of manufactured products – when designing waste management systems. Sanitary landfills are sites where waste is isolated from the environment until it is safe. It is considered when it has completely degraded biologically, chemically and physically. In high-income countries, the level of isolation achieved may be high. However, such an expensive high level of isolation may not be technically necessary to protect public health. Four basic conditions should be met before a site can be regarded as a sanitary landfill (see following.) The ways of doing this should be adapted to local conditions. The immediate goal is to meet, to the best extent possible, the four stated basic sanitary landfill conditions, with a longer term goal to meet them eventually in full. 1. Full or partial hydrogeological isolation: if a site cannot be located on land which naturally contains leachate security, additional lining materials should be brought to the site to reduce leakage from the base of the site (leachate) and help reduce contamination of groundwater and surrounding soil. If a liner – soil or synthetic – is provided without a system of leachate collection, all leachate will eventually reach the surrounding environment. Leachate collection and treatment must be stressed as a basic requirement. 2. Formal engineering preparations: designs should be developed from local geological and hydrogeological investigations. A waste disposal plan and a final restoration plan should also be developed. 3. Permanent control: trained staff should be based at the landfill to supervise site preparation and construction, the depositing of waste and the regular operation and maintenance. 4. Planned waste emplacement and covering: waste should be spread in layers and compacted. A small working area which is covered daily helps make the waste less accessible to pests and vermin. via What is a Sanitary Landfill? Hazardous Waste Landfills – Facilities used specifically for the disposal of hazardous waste. These landfills are not used for the disposal of solid waste. Bottom liner — The bottom liner separates and prevents the buried waste from coming in contact with underlying natural soils and groundwater. In Municipal Solid Waste landfills, the bottom liners are generally constructed using some type of durable, puncture-resistant synthetic plastic HDPE (High Density Polyethylene) ranging from 30 to 100 mils thick. The plastic liners may also be designed with a combination of compacted clay soils, along with synthetic plastic. Cells (old and new) — This is the area in a landfill that has been constructed and approved for disposal of waste. These cells range in size (depending upon total tons of waste received each day at the landfill) from a few acres to as large as 20+ acres. Inside these larger cells are smaller cells known as the daily workface, or sometimes referred to as cells. This is where the waste coming into the landfill for disposal that day is prepared by placing the material in layers or lifts where the waste is then compacted and shredded by heavy landfill compaction machinery. Leachate collection system — The bottom of each landfill is typically designed so that the bottom surface of the landfill is sloped to a low point, called a sump. This is where any liquids that are trapped inside the landfill — known in the waste industry as leachate — are collected and removed from the landfill. The leachate collection system typically consists of a series of perforated pipes, gravel packs and a layer of sand or gravel placed in the bottom of the landfill. Once the leachate is removed from the sump, it is typically pumped or gravity-flowed to a holding tank or pond, where it is either treated on site or hauled off site to a public or private wastewater treatment facility. Storm water drainage — This is an engineered system designed to control water runoff during rain or storm events. This is done by directing the runoff through a series of berms or ditches to holding areas known as sed ponds. In these ponds the runoff water flow is slowed down or held long enough to allow the suspended soil particles to settle out before the water is discharged off site. Methane collection system — Bacteria in the landfill break down the trash in the absence of oxygen. This process produces landfill gas, which is approximately 50 percent methane. Since methane gas has the potential to burn or explode, it has to be removed from the landfill. To do this, a series of pipes are embedded within the landfill to collect the methane gas. This gas, once collected, can be either naturally vented or control-burned. Cover (or cap) — Waste that is placed in a cell is required to be covered daily with either six inches of compacted soil or an alternative daily cover. Some examples of alternative daily covers are the application of spray-on cover material, such as foam or a flame-retardant fiber material. Another type of alternative daily cover is large panels of tarpaulin-type material that is laid over the waste at the end of each day and removed the next day before waste is placed. Other areas within the cells that are not to final grade and will not receive placement of additional waste for a period of time may require additional cover. This is known as intermediate cover — generally 12 to 18 inches of soil. Covering (or capping) is performed in order to isolate the waste from exposure to the air, pests (such as birds, rats and mice) and to control odors. When a section of the landfill is finished or filled to capacity, it is permanently covered with a combination of a layer of polyethylene plastic, compacted soil and a layer of topsoil that will support growth of vegetation to prevent erosion. 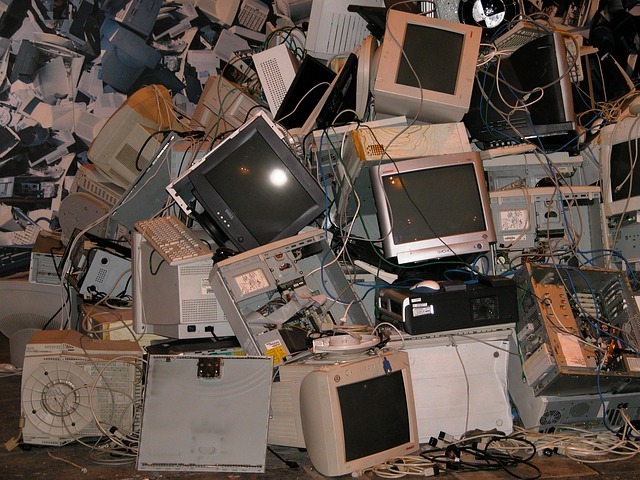 Electronic waste, also called “e-waste [or WEEE]”, also contributes to environmental degradation. It includes anything that operates using a battery or power point that no longer works. Electronics contain chemicals, such as lead and cadmium, that can harm people’s health. This is an extremely hazardous liquid that can contaminate the ground and bodies of water. Organic waste and green waste often get compressed and covered by landfills. When this occurs, oxygen is removed and broken down in an anaerobic process that generates the greenhouse gas methane. Methane contributes to global warming and climate change. Recycling is one of the proposed solutions to control the negative problems caused by landfills. via Why Are Landfills Bad? Landfills create a clear and obvious threat to human health as well as a threat to our environment from the hazardous contaminated air emissions emitted from the landfill biodegradation. There are over ten toxic gases released from landfills, of the most serious of which is methane. Methane gas is naturally produced during the process of decay of organic matter. As methane gas is formed, it builds up pressure and then begins to move through the soil. In a recent study of 288 landfills, off-site migration of gases, including methane, has been detected at 83% of these landfill sites. Methane is a more potent greenhouse gas than carbon dioxide. The key environmental problem we face as a result of landfills is groundwater pollution from leachates (the liquid that drains or ‘leaches’ from a landfill). Although, [modern landfills are] intended to protect human beings from toxins, due to natural deterioration the protective barriers only delay the inevitable. When a new municipal landfill is proposed, advocates of the project always emphasize that “no hazardous wastes will enter the landfill”. However several studies have shown that even though municipal landfills may not legally receive “hazardous” wastes, the leachate they produce is as dangerous as leachate from hazardous waste landfills. The major issue caused with landfill leachates is the leakage of a large number of toxins into fresh water waterways, which ultimately end up in our homes as drinking water or water for everyday use. Since landfills are most often located in and around large bodies of fresh water or in swamps, the pollution often goes undetected. The compounds submerge to the ground, to the ground water, and …[potentially also] to our dinner tables. The pollution is also severely harmful to animal and plant life. Groundwater contamination may result from leakage of very small amounts of leachate. TCE is a carcinogen typically found in landfill leachate. In 2007 the Local Government Association reported that in Britain a combined area the size of Warwick was taken up with landfill. In July last year it warned that the country will run out of space for its rubbish by 2018 unless new sites are found. The real nail in the coffin is the European Union’s landfill directive (first issued in 1999 but ramped up over the years with increasingly ambitious targets), which will impose fines of up to £1 million a day if we send more than 50 per cent of our waste to landfill by 2013 or 35 per cent by 2020 (currently we send 48 per cent to landfill). Waste has always been a conundrum for urban society. The Victorians brought in sewers and the first bins for ash from domestic fires. But it was decades before the rag and bone man was driven out by dustbins and large-scale landfill sites, the latter seen as a logical use for empty quarries. 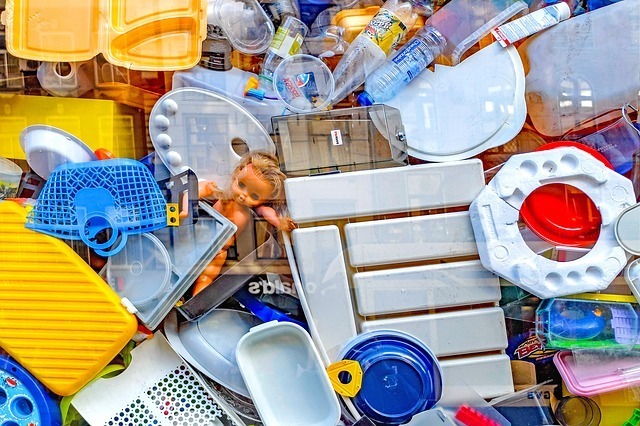 Our waste binge didn’t begin in earnest until the 1970s, with cheap materials such as plastic becoming widespread; the trend accelerated and continued until the introduction of the first mass recycling programmes of the mid-1990s. In the new century we have learnt about carbon footprints and how to reduce them, and a growing number of campaigners have vocalised our concerns about how much ‘stuff’ we consume and what happens when we have finished with it. What Happens Inside a Landfill? In a modern landfill, tightly packed mounds of waste are sealed under a rubber and clay barrier, and over a liner that keeps liquids from seeping out. For a household trash landfill (called a municipal solid waste landfill), the ground is lined first with clay and then with a skin of flexible plastic about half an inch (1 centimeter) thick. Over this, drains and pipes collect a liquid called leachate, which is the contaminated fluid that trickles out of the body of the landfill. Drained leachate is gathered in pools, allowed to settle and treated as wastewater before being released. In 2008, 276 million gallons (1 billion liters) of leachate were collected from New York’s landfills, according to the New York State Department of Environmental Conservation. When the landfill has reached its capacity, the waste is covered with clay and another plastic shield. Above that, several feet of dirt fill is topped with soil and plants, according to New York’s DEC. Rainwater that falls on the landfill runs through the layer of dirt and vegetation and over the protective plastic to collection pools. Inside the landfill, the trash layer forms a gently sloped hill, which can reach more than 150 feet (46 meters) thick, according to New York’s DEC. According to the NSWMA, modern landfills require soil to be added to cover fresh additions of waste every day. The solid waste layer becomes laced with these strips of dirt. Landfills are not designed to break down waste, only to store it, according to the NSWMA. But garbage in a landfill does decompose, albeit slowly and in a sealed, oxygen-free environment. Because of the lack of oxygen, bacteria in the waste produce methane gas, which is highly flammable and dangerous if allowed to collect underground. It is also a potent greenhouse gas and contributes to global warming.